PURE HAIR INC., based in Santa Monica, CA, stays true to its mission and tag line, Beauty with a Conscience, with its brand PURE EXTENSIONS. 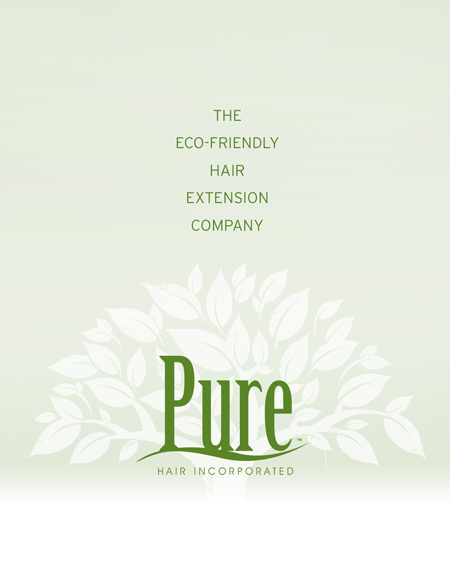 PURE is the first hair extension company to recognize and act on its responsibility to the environment. Believing that beauty can be green, PURE strives to inform other manufacturers and salons about ways to be more responsible while still offering the best products in the marketplace. Everything we create is either recycled, recyclable, reusable or biodegradable. From the extension application to the minimal packaging, no waste is tolerated. PURE CEO and Founder, Michael Burchard, along with his PURE team understand the importance of maintaining healthy hair and a healthy environment. They are also aware of the amount of waste that consumes the beauty industry through redundant packaging and harmful chemicals. As a response, PURE seeks to bring their beauty awareness and eco-conscious vision to the rest of the beauty world. PURE envisions a complete line of beauty products made from completely recyclable materials and hair care products that eliminate the harsh impact made on mother earth, our hair, and our skin.